As self-proclaimed tree lovers, there’s nothing we dislike more than having to uproot a tree and drag it away from its home. But we also understand that this is a last resort, and trees pose many risks to homes if they are not maintained. When a falling tree damages a home, car, business or government building, the vast majority of the time it could have been avoided had the proper safety measures been taken. 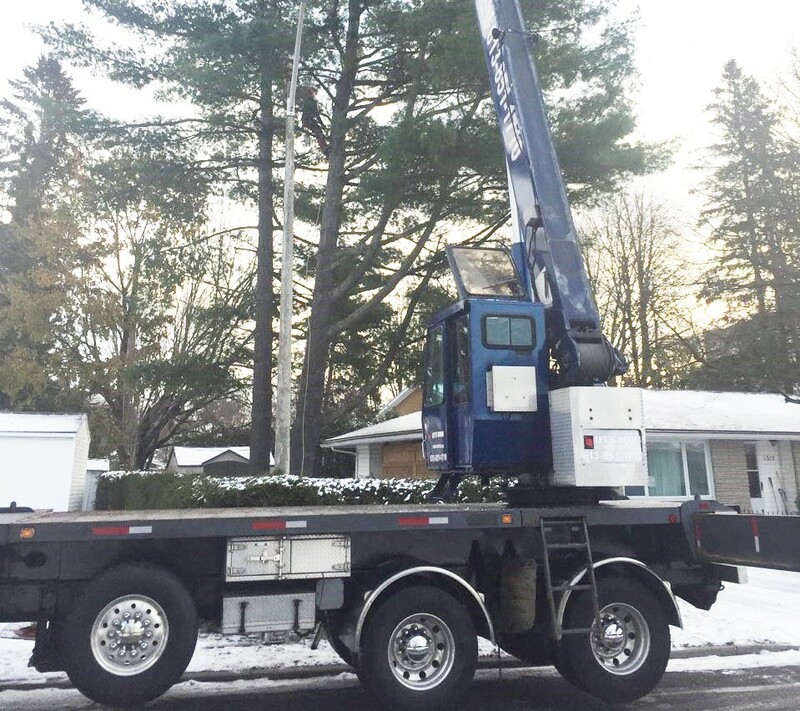 Rock’s Tree Service offers expert, fully insured, and fast residential and commercial tree removal services throughout the Ottawa region and surrounding area. Our tree experts will survey the property, determine the best plan of action, provide you with a free and honest quote, and get to work on mitigating the dangers immediately. Our goal is to make this process as convenient and stress-free for you as possible. 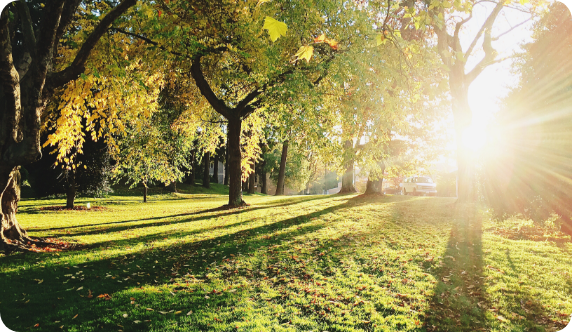 Our combined years of customer service and reputation in the local area are a product of our passion for trees, the pride we take in seeing a job well done, and our commitment to customer satisfaction. Caring for Mother Nature is more than just a job to us, it’s what we love to do. Why Choose Professional Tree Services? When they aren’t cared for properly, trees can pose a danger to people and homes. By law, you need to take the proper steps to ensure safety. Going it alone might be tempting, but please be aware that this process is often much more complex than simply cutting down a branch. There’s a reason why tree experts need to go through rigorous training and achieve certification. Choosing a professional service ensures that the job is done right and you, your home, and family are as safe as possible. The soil is heaving (turned up) at the base of the tree. Fungi, such as mushrooms, are growing around the trunk. Excessive cracking is found in the trunk. Dead branches are hanging in the canopy. Rock’s Tree Service is equipped to reach up to 112 vertical feet to effectively work within the canopy. Our tree specialists take the necessary precautions to deploy a safe removal procedure for themselves, the tree, and your home. Ottawa residents are encouraged to get in touch with us by calling 613-725-7644. Rock’s Tree Service is dedicated to providing excellent service to our customers in a safe and efficient manner along with competitive pricing. Why use a crane to remove a tree? The tree removal crew will survey the site upon arrival and identify the best area for the crane to be set up. Factors such as elevation/grade changes, overhead obstacles, and distance from the landing will be taken into consideration. Each tree is different and will require a different course of action for removal. Prior to lifting the tree climber/cutter into place, the crane operator and tree climber will formulate a strategy for the removal process. The climber will tie his support line to a secure place, and he will signal for the crane operator to lift him to the designated point where the crane will attach to the tree for removal. Once the climber has secured himself, he will make the appropriate cut. Simultaneously, the crane operator will apply the correct amount of force and move the crane into the correct place for extraction of the piece. As soon as the piece has been cut all the way, it will be safely lifted and maneuvered through the air to the drop zone. 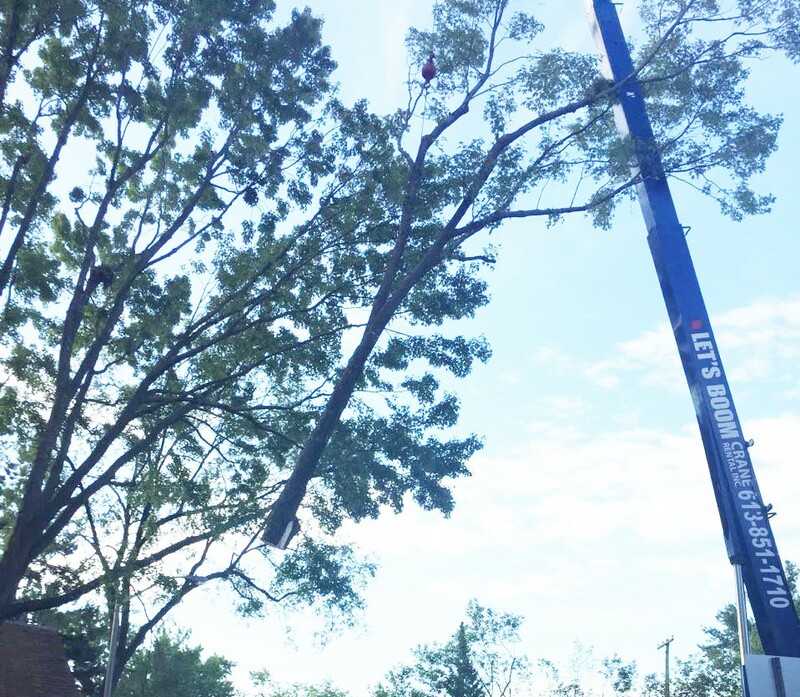 Piece by piece, the tree will be removed in a safe and efficient manner. What is the crane’s reach? The Manitex model 30112S crane reaches up to 112 feet vertically.